The below text has been adapted for the web from the book "Restoration Initiative: Torcello - Venice, Italy", © Milestone Architecture PLLC. 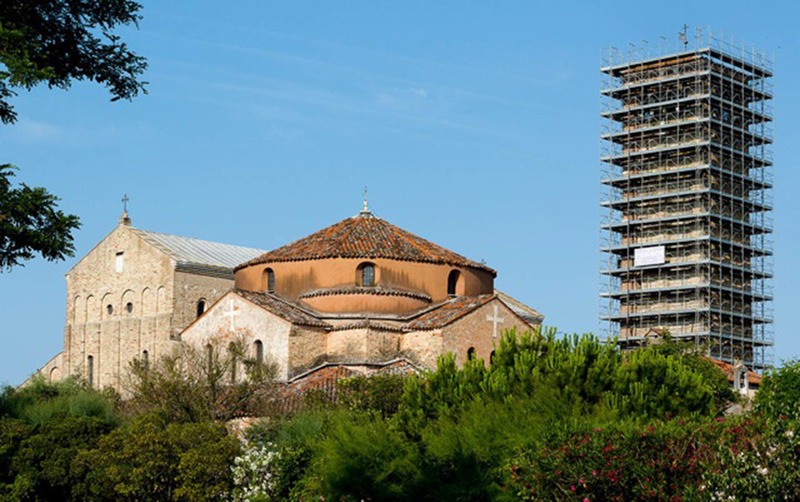 "The subject of this survey, a joint venture sponsored by Sansovino Restauri and Milestone Architecture PLLC, is the Basilica of Santa Maria Assunta, the Martyrion of Santa Fosca on Torcello, and their context. This survey used many different combinations of digital software to produce measured drawings that probe the scope of needed restoration work, and to produce experimental images that document the site, the structures, and their meaning and history." "Venice was established before the fifth century CE by mainland communities seeking refuge from the invasion of the Hun tribe. Archeological and architectural scholarship have revealed a period of Roman settlement throughout the lagoon during the first century CE, which was subject to a rapid population decline due to diseases caused by environmental changes. After this period of depopulation the area was re-populated during the sixth century CE. At present, the island is very sparsely inhabited, with only six Torcellani who permanently reside there, according to their own report to us…Despite the few permanent residents on Torcello, the ancient monuments continue to draw many visitors, who come there for both artistic and religious motives, to view the structures that are as compelling today as in times past." "The aggregation of historic structures on Torcello includes, among others, two churches: the Basilica of Santa Maria Assunta and the Martyrium of Santa Fosca. Torcello is situated remotely from Venice within this lagoon landscape, and it is accessed by waterways only. The church structures on this site are grouped in a disposition reminiscent of eastern Christian and Islamic planning, where individual building components, having diverse functional uses, are amassed into a unified building envelope that encloses small exterior spaces. All of this is appropriate to the climate of the lagoon and the difficulties of the period in which they were established. Both churches are still actively used for their intended religious purposes." "The survey method used at the Torcello site is like ancient methods in that it measures from point to point to replicate the proportions of the site’s components. The 3D laser scanner works by projecting laser light onto an object’s surface. By detecting reflected light the laser scanner registers thousands of precise points that compose a multi-dimensional cloud. Those points are then calculated by computer software to create digital two-dimensional drawings and multi-dimensional models. Individual files containing point clouds of data can be coordinated and registered to one another by associating them to a common target point so they can be correctly located in space in relation to one another. The point clouds of data can be rendered with colors reported by the camera, within the laser scanner, or can be rendered in black and white. They were thus ready to be exported to other softwares for further processing after selection of the desired format." "There is evidence of restorations spanning from the 13th century to the present time, occurring with greater frequency during the 19th and 20th centuries. Two significant restoration attempts, undertaken by Rupolo (1908-1915) and Forlati (1929-1939), represent an historical moment and a concept of restoration that wanted to use the best cutting-edge materials, even if they seemed to forget a part of the past. One of the greatest challenges presented by this site is the unique environment of the Venetian lagoon. Torcello predates much of modern Venice; increasingly dramatic climate changes have caused an enormous amount of stress not only on the ancient church structures but also to the agriculture of the island. To restore these buildings into a form that can withstand further weathering would serve multiple purposes: first, to preserve an exquisite example of Christian architecture, representing influences from both East and West; and second: to reestablish institutions that are central to the community of Torcello, allowing the island’s inhabitants to gather and thrive as they had in centuries past." "The concept of UNESCO World Heritage includes both tangible and intangible assets, and their great cultural, natural, social, and historical value. From the point of view of promotion and touristic use, improving the communicative component of World Heritage sites is a global and multidisciplinary action. Iconographic tools coming from Communication Design have, as a main feature, graphic and bi-dimensional semiotic tools, designed for “standard” users. We know that, in truth, people are not equal to each other, but all have their own unique characteristics and specificities. This human uniqueness is incompatible with the attitude of "classical" user-centered design. Therefore, for the enhancement of the heritage of the Torcello site, the consideration of singularity of the individual, of his desires and his aspirations becomes a condition that must be taken into consideration by the Communication Design, enabling effective design solutions. In addition, site-specificity has to be considered for each UNESCO site, which then amplifies the differentiation of information to be communicated. As a result of this project, we hope to implement navigation and informational tools that will benefit people of a variety of physical and cognitive abilities."